Anyone with petrol running through their veins knows there’s something special about an Alfa Romeo, even more so one with sporting pretensions. But with limited resources - and with the exception of the wildcard SZ - the Italian manufacturer hadn’t produced a hatchback two-door coupe model since the GTV and GTV6 were discontinued in 1987. 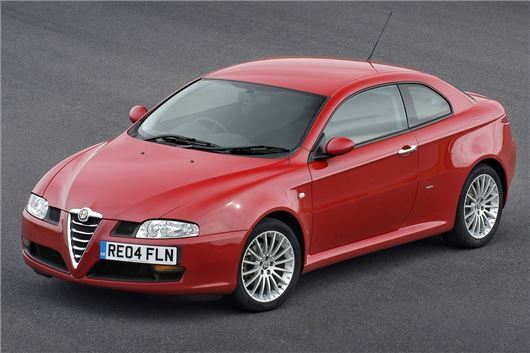 That changed in 2003, with the much-vaunted launch of the new Alfa Romeo GT, a car for which expectations were extremely high. It was the fourth car in a major product offensive, which began in 1996 with the launch of the 156 and 166 saloons, followed by the compact 147 in 2000. The GT arrived in 2003, and was based on the same platform as the 156 and 147, with largely the same engine range - though the 1.6-litre petrol and 2.4 JTD were left out, as was the 2.5 V6. What it did get were 140bhp 1.8 and 160bhp 2.0 JTS petrol engines, a 1.9 JTD turbodiesel with either 150 or 170bhp and a screaming 3.2-litre V6 24v unit with 237bhp on tap, which was an absolute joy. It wasn’t only the engines that were shared, either - the main dashboard components were pretty much identical, as was the bonnet, while the front wings and door mirrors were taken directly from the performance version of the 147, the GTA. Despite taking many parts from the smaller model, the 147 was pitched towards premium opposition. Alfa said it was taking on the BMW 3-Series Coupe and Mercedes CLK with the GT, though in realistic terms it was probably more of a direct rival to the Peugeot 406 Coupe and Toyota Celica. It was styled by Bertone and was riven with praise at its launch, partly for its devilishly good looks, and partly because it was based on an already proven platform that gave it superb dynamics and handling. It mattered not that it lacked the interior quality of its German rivals, or that the European press launch descended into comedic pandemonium because the pre-planned route tried to send every single driver the wrong way down a one-way street (we know, we were there and got around this minor detail with a reversing manoeuvre that Mr Bean would have been proud of). The GT was an Alfa Romeo, and it Alfa Romeo-ed very well indeed - flawed but beautiful, designed with flair, engineered with soul and stuck together with Tiger Seal and gaffer tape. Over time, the GT proved itself to be fairly reliable (Selespeed semi-automatic models notwithstanding), and mechanical durability was much better than that of some of the trim components, which may have felt quite well-engineered when new, but very soon began to live up to Italian clichés that we don’t want to use, but are compelled to - stereo buttons that fell off, internal switches that pushed in and never came back out and door cards that worked loose and began to rattle were just a few of the problems, but die-hard Alfisti would have it no other way. Sadly, the GT is also a victim of another Italian cliché. Like the 156 and (to a lesser extent) the 147, it does like to corrode, and while rust very rarely manifests itself on the shiny side of a GT, it does like to nibble away at its undercarriage. The first time the owner becomes aware of it is when the MoT man hits it with his toffee hammer, so check a potential purchase’s MoT history carefully. It’s the sills and rear floorpans that are worst affected. What this means, though, is that GTs are surprisingly accessible to buy. It’s entirely possible to pick up a usable one for under a grand, while if you can raise £3,000 you’ll end up with one of the very best. That they’re worth so little is a crying shame, but it won’t be for long - future classic status is assured by both the badge and the styling. The biggest tragedy, though, is that Alfa Romeo never signed off Bertone’s convertible version of the GT, citing body stiffness concerns as the main issue. It was so drop-dead gorgeous that, frankly, we don’t think anyone would have cared. Remember the 2.0L JTS engine ? Those who knew believed that the rated 165hp never was achieved even at the factory exit gate. Those who had them with 30,000 or so miles and put them on a dynamometer knew that 125hp was a more likely outcome. Flat top end that limited top-end performance. An unfortunate venture into direct injection. Otherwise absolutely brilliant to drive. Finally. let's not talk about timing belts...!